Does occasional illness put your plans on hold? Want a way to reduce your recovery times from the inside out? When you're ill, you don't feel like doing anything. You can't be as productive as you like, but you know that as soon as you recover there'll be a lot of catching up to do. So wouldn't it be great if you could lessen your recovery time? 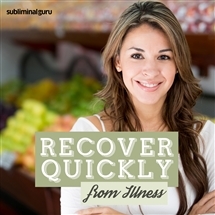 With the Recover Quickly from Illness subliminal session, you'll give your immune system a quick and lasting boost! As you listen, thousands of powerful positive affirmations will rewire your subconscious, helping you get better in a hurry. You'll fight off infection easily, keeping your mind and body strong and healthy. You'll create a more robust defense system to ward off disease and keep bugs at bay, making it easy for you to carry on with whatever you want to do. Download the Recover Quickly from Illness subliminal audio now to make a swift recovery from any illness or complaint. I bounce back quickly from illness. I fight illness off easily. I am in excellent physical health. I eat well and exercise often. I give my body the rest it needs to recover. My recovery time from illness is amazing. I am strong in mind and body. My body quickly deals with illness. I take good care of myself during any illness. Getting over illness is easy for me.